Grid tie inverter is a device which directly converts direct current into alternating current whose sine wave, frequency and phase are the same as power grid and then feed it into utility grid. It is a key device of power generation systems such as PV power generation system, wind turbine power generation system.It is a key device of power generation systems such as PV power generation system, wind turbine power generation system. The Grid tie inverter specially optimizes design to work with modularization of DC power supplies which includes the mainstream solar modules, 36V (72 cells) monocrystal. wind turbines and batteries. Stable, reliable and of high conversion efficiency, it is best choice for PV power generation systems. 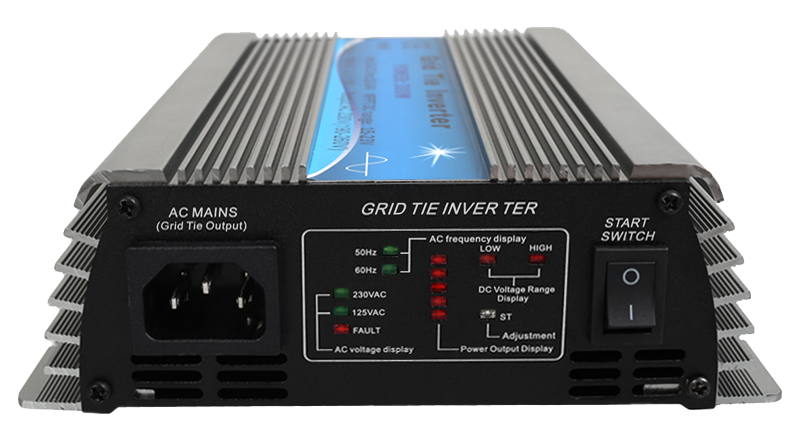 The Grid tie inverter can be easily placed and attached to the rack underneath of PV module. It does not need spaces for independent installation and low voltage DC wire connects from the PV module to Smart Microinverter. Suitable for 30V / 36V solar panels, or 24V / 48V battery grid power generation; Make sure Voc of solar panel is within 24~38V / 44~46V. Specific design for 24 V (60 cells) and 36 V (72 cells) PV module; but also suitable for 24 / 36 / 48 V battery and small wind turbine system with built-in AC-DC charging controller which’s output voltage is 24 / 36 V.
15 - 60 VDC Wide input voltage, classification processing for different input voltages from different DC power supplies. Unique circuit design, choice of import industrial electronic components, higher efficiency, more stable performance. Creative MPPT technology, efficiency more than 99%, faster reaction, more sensitive of reaction and more reliable of Maximum power point locking. Parallel modular design, small volume, distributed installation, easy for system configuration, flexible for conbination, strong expansibility of system. Adopting high-frequency isolation transformer type, high efficiency, high security. Aluminum alloy housing, not rust, heat-resisting and cold-resistant as well as anti-corrosion. Getting electronic circuit design, appearance design and other core technology patents. Stack Multiple Machines: Multiple small power inverters in parallel by AC output can achieve large output power. In order to achieve higher power use requirements, this product can be stacked, such as: 5 grid inverter 500W stacking can achieve 2500 W. And the number of the stacking is unlimited. Adopting high-frequency isolation transformer type, high efficiency, and high security. Islanding protection: When the city power system is in failure, the inverter will automatically turn off the output within 0.5 seconds. Parallel type design for DC input and modularization design for inverter, small volume, distributed installation, easy for system configuration, flexible for combination, strong expansibility of system. 2、 Two-way grid means: Load consumedirectly. And can reverse AC currenttransmission. 3、 One-way grid means: Load consume directly. And banned reverse AC current transmission.  Kinds of frequency output function. It can applyto 50Hz and 60Hz frequencyof AC. AC phase angle of 0 through isolation amplifierthen input to the MCU for high-precision detection and analysis. The phase shift rate is less than 1%, thus achieve high-precision with phase modulation AC output together. semi-100Hz frequency alternating current generated combination, to achieve high-frequency modulation. Use SPWM directly to make pure sine wave output. 1、Output waveform: Adopt complementary PWM to push-pull pure sine wave. data can be directly displayed on the LCD. Then you can visually see the sense of the strength of the sun unit. 1、Power lock: The biggest sampling point of MPPT. Adapt to any of the power load. This product is constant current, constant output power, without any overload, over-current phenomenon. When the city power system is in failure, the inverter will automatically turn off the output.  Multiple small power inverters in parallel can achieve large output power. Adapt high frequency converter, the output more efficient. achieve a stable output purposes. 1. Red terminal: Connect DC positive, black terminal: Connect DC negative. 2. AC socket: Connect to the mains. Put the side of the AC cord which has holes into the inverter with 3 foot outlet and the other side of the AC cord to home 3PIN AC outlet. 3. Switch: Connect the connections in right way, then turn on the switch. The inverter starts to work. Solar Panel: Recommend using the power more than 500W and the standard voltage of 36V PV panels.  Wind turbine system: Rated voltage 24VDC, maximum voltage 60VDC.  storage battery: A, 12V*3=36VDC(or 12V*4=48VDC) Three groups series connection. 1、Low-voltage protection (input DC voltage is less than 15VDC). 2、High-voltage protection (InputDC voltage is greater than 60VDC). 3、FAULT: Power grid failure or inverter their own fault. 4、Power output display: Follow the inverter power output size flow flashing quickly or slowly. 1、AC voltage display: Display the power grid voltage. 2、AC frequency display: Display the power grid frequency. ---Non-professionals do not disassemble. Only qualified personnel may repair this product. clear around the inflammable and explosive materials. ---When using this product, avoid children touching, playing, to avoid electric shock. DC voltage drop caused by wear and tear. ---Connected to a power outlet to provide AC. ---Connected solar panels, battery or wind generators DC input DC power supply cable. ---Proposed wind power plant with its own charge controller and load dump.